For a brief period in 1959-1964, NASA and the US Air Force actively considered launching manned flying saucers into space. Although very much in tune with UFO mania and science fiction films of the times, the concept lost out to other aerodynamic concepts. Alan Kehlet was an aerodynamicist at NASA Langley. He played an important role in the NASA's Space Task Group New Projects Panel, which established the American space program for the 1960's. Kehlet first conceived of his lenticular manned spacecraft design in 1959. He was unsuccessful in getting the concept accepted for the Apollo program, although each bidder was asked to conduct an engineering analysis of a lenticular version of the spacecraft. Kehlet moved to North American Aviation in 1962, and the company proposed modified versions of Kehlet's vehicle for manned military and shuttle missions in the early 1960's. 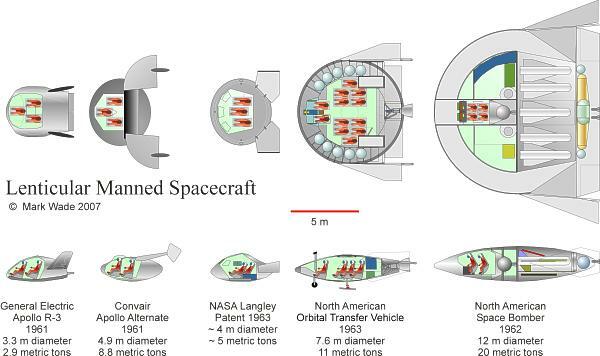 Kehlet argued that a lenticular vehicle, as a manned spacecraft launched into orbit by a conventional booster, had clear advantages over ballistic, lifting body, and winged designs. At hypersonic re-entry speeds it would undergo lower heating and require less shielding. At the same time it was more maneuverable at subsonic speeds than a winged design, and could land at sea or on land without undercarriage. The symmetrical shape meant it would integrate easily into conventional booster designs, without creating excessive drag or asymmetric loads during ascent to orbit. A saucer-shaped vehicle was inherently aerodynamically unstable and would require aerodynamic surfaces to allow controlled gliding flight. Kehlet advocated the use of deployable fins that would conform to the convex top of the saucer during most of the mission, and only be deployed when the spacecraft had slowed to below Mach 2 after reentry. Of the Apollo bidders, Convair accepted Kehlet's design with little modification. General Electric believed it to have heating and stability problems, and proposed a modified version, a lifting body with only a whiff of the pure lenticular vehicle about it. In later North American studies, a permanently fixed square surface was mounted to the aft hemisphere of the saucer, providing aerodynamic control during re-entry as well. This increased the cross-range capability compared to the original design. By the end of the1960's exhaustive aerodynamic tests converged on the X-33-type lifting body or the Space Shuttle-type cranked-delta winged vehicle. Lenticular concepts were not considered during the Shuttle design studies, and the opportunity to fly a real flying saucer passed into history. Bono Saucer American manned spaceplane. Study 1963. In 1963 Phil Bono of Douglas Aircraft considered a lenticular configuration for a single-stage-to-orbit reusable booster. This was the largest application found to date for the lenticular concept.